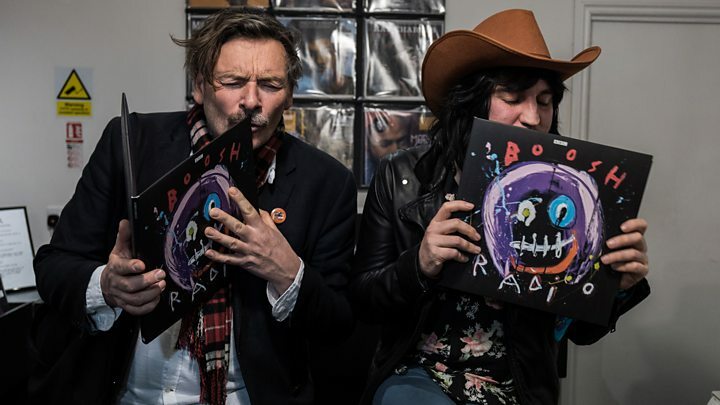 The Mighty Boosh have been announced as the 2019 UK ambassadors for Record Store Day, which celebrates independent record shops around the country. Comedy duo Noel Fielding and Julian Barratt follow the likes of Elton John, Dave Grohl and St Vincent in the role. "The bar's been set at a new height," Julian tells Radio 1 Newsbeat. "I didn't want it to change me but I think it might have," Noel Fielding adds. "It's definitely put a spring in my step." This is the comedy duo's first official outing as The Boosh for more than five years. Since their BBC TV show came to an end in 2007 they've done a live theatre tour and made a handful of appearances at festivals around the world. 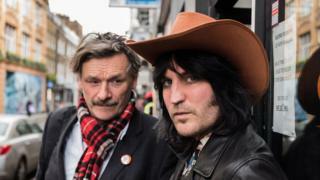 Despite saying they'd "love to put out" live shows and an album of tracks they recorded in New York "at some point", the duo say their Record Store Day duties are, for now, a one-off appearance for The Mighty Boosh. It's fair to say they're taking their role seriously though. Noel and Julian say they're on a mission to get the nation to "slow down and get physical". Julian remembers his "formative years" discovering music at Jumbo Records in Leeds: "It's about chatting to the people behind the desk, the people you bump into in the shop... it's a magical journey, a pilgrimage." He says that whereas now you "turn on the digital tap and music just comes out", it's not like that with physical records. "You've got to get over this hump of effort with records - it make you choose differently. "You're fighting for attention and that's why it's important places like this exist." Noel says it's nice to go through somebody's record collection, too. "If you were on a date or you'd just met someone, you could have a peek at their collection and think 'Oh, this isn't going to work'." To celebrate their role as UK ambassadors, it was previously announced that the duo's original radio series will be available on vinyl for the first time. The show made its debut in 2001 on BBC London Live, before eventually being aired on BBC Radio 4. "It was on in the afternoon after a sports round-up... that presenter hated our show," Julian says. Noel adds: "He'd be talking about how Spurs were playing then he'd go, 'Anyway, now we've got... I don't even know what this is'. "Then our show would come on to a load of angry football fans." As fans of The Mighty Boosh might expect, they've also got a more surreal ambassadorial offering. "We can come to people's houses and provide a personal service," Noel offers. "We'll push vinyl into people's faces and make them smell and feel records. "We might also melt some vinyl down and make shoes out of it. There could be some hats and broaches? "We're here for you, we're here for all of vinyl and record shops. Well... all the independent ones in the UK." Record Store Day takes place on 13 April.